I ain't dead! 2013 was just too packed with real life to devote time to TSS, but I have still been painting here and there, so there is a bunch of stuff to post about. I have had no internet access at home, which is still not resolved. I'll probably resort to lining up posts then blasting them out at a local cafe's wifi hotspot. Have a great holiday season, and see you in 2014! Last night after dinner, I was going to boot up the PS3 and start playing Dishonoured. But at the last second I changed my mind in honor of tabletop day, and got stuck into a game of Gunstorm on my new wastelands board. The board is 4 cork tiles (fast becoming my ubiquitous terrain material) painted with textured paint and finished with scumbled-on colors, a black wash and several drybrushes. I finished it over the course of the day while painting the Rugular Show crew. It gave me achance to dig out my shanty town terrain, and has enthused me to build some more! First I statted up the forces. Mordecai and Rigby were Legend quality, Muscleman was a veteran. I used my new "blank" style data cards. This photo is from later in the game when Rigby had 1 stunt tapped and the other burned, hence the blue and red counters. Notes: Not enough room to write on! I statted up 150 pt forces. Next I set (made up) the scenario. There were 4 objectives, represented by my transparent green skull markers. A figure had to spend an entire phase in contact to "search" them. The key objective would be found on a 4+, with +1 for each already searched marker. The winner would be the figure that got the objective off the board via their entry point. Fortune phase. Dice off - casualties to choose the phase and un-tap 1 stunt. Turn over, return all chips to cup. A turn is played by drawing a chip, completing the phase, drawing another and so on, until you draw the Fortune chip and the turn ends. marker. Turned out to be nothing. The enemy movement rules worked well, if a little dull. This is a d6 chart with +1 if there are no targets in sight. The chart gets progressively more aggressive in result. I liked how you determine each enemy figure's behaviour with a single roll, but the directions were too wishy-washy. I need to make distinctions regarding whether an objective in contact or an enemy in close combat counts as the "nearest enemy/objective". It's more fun if they are not the same. Notes: Put more detail in the enemy movement chart! Combat worked pretty well. 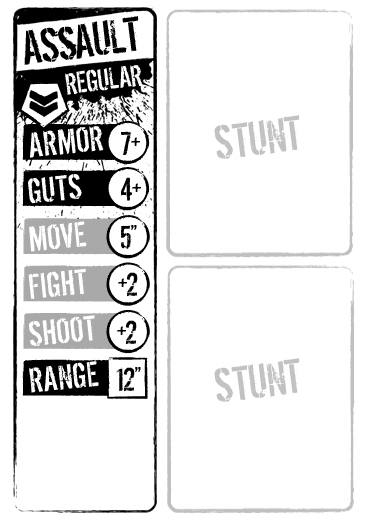 I had deliberately statted the Vornids to be quite weak, with only +1 shooting and rifles (a further +1 with 24" range) This meant that to hit the Regular guy's armor of 7, they needed 5's in the open and 6's in light cover. They would have to combine fire to have a chance of hitting a Regular guy in hard cover. Thus, the vornid troops' shooting was ineffective, but the Captain managed to roll a 6 with his Autoblaster, causing 1 Overkill to boot. Muscleman failed his Fate save (with the -1 Overkill modifier) and drew a crippled counter, meaning he would be unable to move for the rest of the game. Meanwhile (not pictured) Mordecai's sprint value of +2 meant he moved 6" per move phase and he managed to reach an objective and find the Key Objective while remaining out of sight of the sluggish Vornids. On the left, the vornids all rolled very high and rushed Rigby. 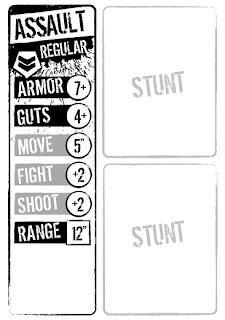 This was possibly a bit stupid of them as he was statted with +3 Fight and equipped with a Heavy pistol (+2, useable in close combat) and burned his "Shred" stunt, allowing him to add a further +2 and split his attack! The Vornids, having no close combat weapons and a +0 Fight skill, had to "pile on" and combine their attack, to no avail. 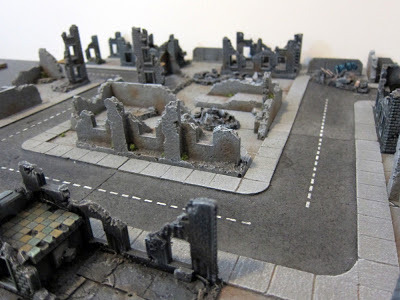 Rigby dealt out two wounds, but the lucky Vornids drew "crippled" counters, meaning they could not move, but had no other effect on close combat. Mordecai meanwhile (again, un-pictured) ran off with the objective and ended the game. Notes: Wounds need to be more interesting! I'm still happy with the basic mechanics and how the game plays out. This is a very good thing! However I feel like the solo aspect could use more fun. It still feels a bit too much like playing a 2p game on your own. The Stunts selection is a bit ropey too and needs a serious edit. I think the first way to fix this is to introduce character templates. The player should be abe to pick his team in a faster, less math-y way. Something I love about Pulp Alley. Choose team members based on class. (Tactical, Assault, specialist, Heavy) which will give you a loadout. Then choose 2 "items" each. Instead of having different costs as the rules stand now, all of these items simply take up one item "slot" on a character. They will all have a Tap and a Burn ability. This means you can make a character by choosing a Class (including rank) card and two item cards. No book keeping, or writing stuff down. The mecnahics are largely the same, but just hidden behind some streamlining and components. It will be a bit of work making the cards, so I will hold off and use post-its or something until I'm sure it works. As for scenarios, I think the most successful ways of creating suspense are games where you don't directly control the enemy setup. THW games do this with PEFs and Platoon Forward does this with Blinds, which are similar but different. I'm working on a system of representing uncertain disposition of enemy models that hopefully has the same suspense, but is tailored more toward man to man (5-10 models a side) scaled shootouts. I'm not sure how it will shake out, but the idea is that you can only track targets in your line of sight, and they can duck back out of it and effectively vanish into the enemy pool. I have some simple ideas, but they will take some working out. So the rules are basically OK, with the exceptions that the enemy move chart needs improving and the crew builder is still really only in Alpha condition. I'm off for a think now, but at least I haven't freaked out and declared the rules broken and dead, like I did the last couple times... It's all part fo the hobby though and I see it as time well spent! Last night I was digging through my unpainted figure boxes and happened across my unpainted Harook. As it happened, I had just finished watching the last episode of Regular Show season 4 (I love Regular show)... I saw Mordecai. Rigby is a RAFM Traveller Vagr, painted like a raccoon. Benson is an Artcrime Nationlist trooper with a blob of putty to embiggen and en-rounden his head. High Five Ghost is a Harook drone from the sniper pack, with the original flight pole removed and a paperclip in it's place. Muscleman is a GZG Alien Merc, with hair sculpted with Pro-create. I have a figure on order for Skips, and am currently converting Pops. If none of this means anything to you I apologize, but I had a lot of fun converting and painting this lot. Happy Easter Weekend folks! Something made it out to the snow... Here's the companion piece to yesterday's abomination. Nasty little crab beast... Looks a little familiar. This slithered it's way into my last shipment from Khurasan... A hideous whatchamacallit from another world. Pictured here on a 25mm round base I dressed up with coffee stirrer and texture gel. I used gloss varnish on this fella. Seemed appropriate and helped smooth it all together. I didn't think this would be the best option, but it really worked amazingly well. A great solution that maintained the uncertainty of the next phase, but eliminated boring repeats of phases where nothing happened. Plus changing the stunt un-tap to a choice of 1 stunt (much better) when the yellow chip is *won* by the player worked a treat as well. 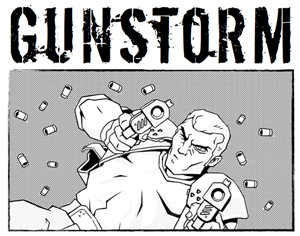 Just some tidying up of the rulebook and this puppy is ready! I tried slapping together the photos I took during last night's game in Comic life on my iPad. I now see that it screwed up the layer sorting on export and I should have proof read it... Whoops. The game is at a bit of a crossroads right now, unsurprisingly. I'm happy with the dice mechanics, the build system, the stunt system, the wound chit draw... It's the random turn sequence that is a bit off. The idea is directly from "Sacre Bleau!" with a dice for control replacing the "descisive moment" in the original. It works well to create a suspenseful and chaotic atmosphere, but sometimes if you get a long string of the same roll (eg: the enemy gets 3 or so firing phases in a row where it cant see anything so can't fire) it ruins the "what's going to happen next?" feeling somewhat. Draw a chit to see what phase it is. Resolve the phase, then place the chit to the side until eithr all chits have been drawn, or the Moment of fate is resolved, in which case all chits go back in the cup. This would mean a turn with an unpredictable order, but one less likely to keep repeating the same phase too many times in a row. I have some nice wooden counters in mind to use. The second solution is a much more radical change, but might be a better solo experience. The game is igo-ugo. On the player turn, take a number of d6 equal to the number of your force's figures on the table. Roll them and then choose 1 die result to assign to eqch of your figures. On the Enemy turn simply roll a single die for each one to see what it does. This is kind of cool bcause it gives you random, semi-limited control, but also gives you some choices about how to spend your dice. Also enemy behaviour is pretty straightforward, yet quite unpredictable too. I havent tried either method yet, anybody tried something similar? Had a couple of games, tweaked a lot of rules, still thinking about streamlining. The good news is it didn't fall apart when it hit the table... Whew! Version 1.1 now done, I see the core system being finished this week. The pocketmod format, for those who have not heard of it, was originally conceived as a cheap recyclable alternative to the PDA/Palm Pilot. It's essentially a way of folding a piece of paper into a handy sized booklet. There is a growing movement in the print and play/indy RPG community focussed on releasing game materials in this format. Why have I adopted it? First of all, 8 pages is very limiting. If there's anything that gets me firing on all cylinders it's a limitation. Thus I got these rules knocked out in four evenings... Something I would never have managed with an unlimited format. Secondly, it's a great size for my gaming and it's very easy to print! 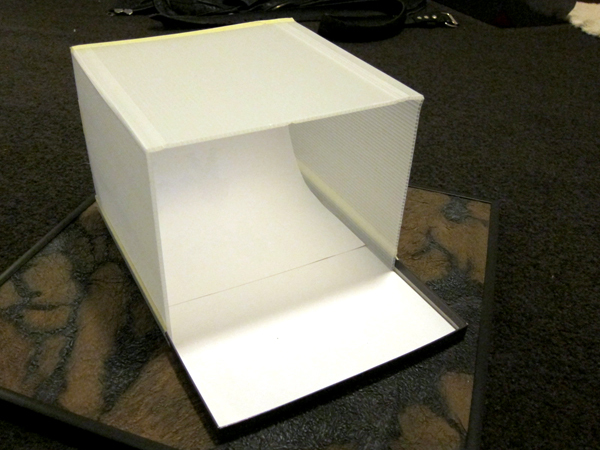 No binding or printing lots of pages.. Just one page and one cut.... Book. I love it. I'm about to take the rules for a spin. They are based on mechanics from two different skirmish systems, with a completely new mechanic of my own thrown into the mix. If it works out I will draw a cover and release this thing. It's Saturday and the sun is out! After a pleasant ride on my sweet Harley to Newtown (for breakfast) I Broke out the camera and tripod this afternoon to take some non-phone pics for Jon of his exterminator range. 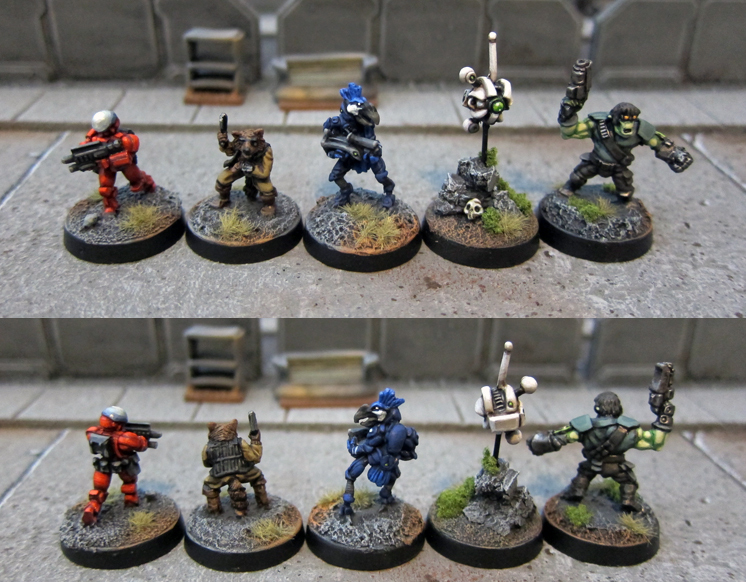 These may be used (with my full permission of course) in a new rule book from Ganesha Games in the future. I don't know much more than that, but I'm a big Ganesha fan so it's nice to be involved. Here is a photo with the figures from the different packs in a row, as requested in the comments section last post. There is some difference when examined like this, but it's well within tolerance for me. 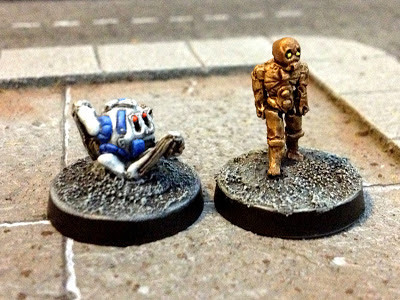 I have found over the years that small differences in size are not noticeable during a game unless the two figures are in base contact, and even then it's hard to tell at table distance. I'm going to spend the afternoon finishing off my Meso Nasai, and messing around with getting my latest solo skirmish attempt into pocketmod format. This should make it very easy to print out (1 page) and add tiny supplements to. 8 little card sized pages may prove too constricting, but then again I am a big believer in tight contraints being very productive. We will see. Great sculpts! I will be taking some better photos with the rest of the exterminators when I get some daylight. I used the same colors as the other squad members, VMC US army dark green and Russian uniform. Special thanks to the amazing Jon at Khurasan for allowing me to blog post these before the internet jackals beat me to it. Thanks Jon! As promised, here is a quick layout I put together with my cork ground modules, cork ruined walls, and Proxie models plastic ruins sections. This does not include any of my 10 or so intact buildings or my straight road piece, so I think I have more than enough city ruins terrain for the time being! 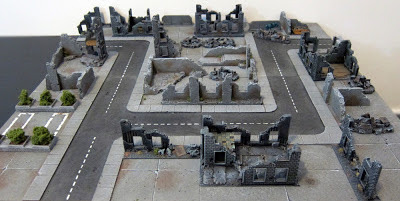 I have another pack of 2 story corner ruin sprue still sealed, so I think I'll slap that together next while I'm dirtying up my intact buildings. Speaking of dirtying up, the streets definitely need some shell holes and grime... They are much too clean for the rest of my scenery. No big deal though, I originally wanted them to be useful for a clean city. Pshaw to that though! Too tired to paint minis tonight, but not to make some easy terrain in front if the tv. Takes Superglue. No drying, no melting. Soft and grippy on the underside. 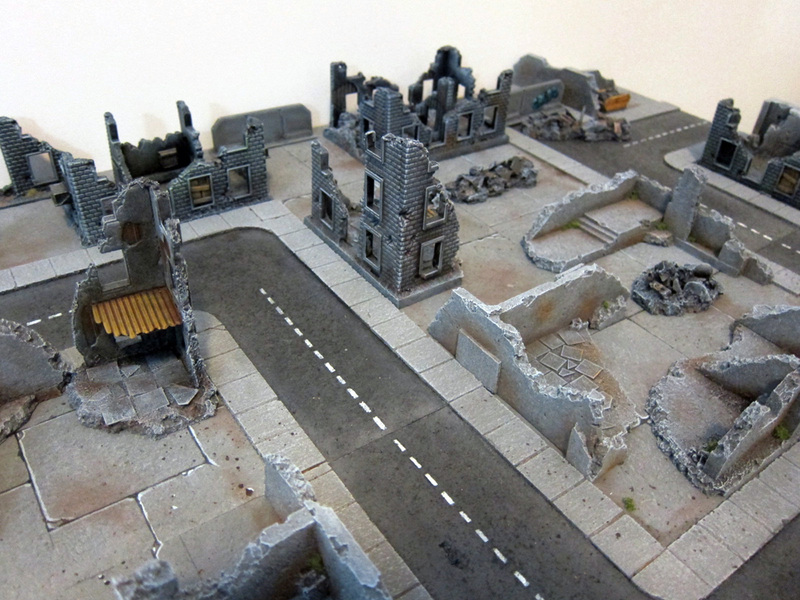 My City ruins board is looking much further along now than last week! It's the end of the week, so I made this post with my real camera and computer rather than solely with my phone. Hooray for the weekend! Finished this little project tonight. Some freehand markings and lighting effects make a nice counterpoint to the rough weathered US Dark Green (VMC paint) color scheme. I have a secret when it comes to unit markings like these.. Straight lines. Everything is composed of a quick, thin straight line. You can make a sharp cornered end to the line by simply making another straight line across the end with the background color. Finally, here he is next to the other Exterminators. I'm running low on tufts, so I threw on some clump foliage too.. I quite like the variety it creates on the base. Im almost finished with ANOTHER secret Khurasan paintup, I'm hoping I can talk about either one soon. I also have been working on my Meso Nasai unit, which is looking good in red. Here is the basic paintwork done and the rebuilt weapon glued in place. Some dirty washes are in effect and the figure is starting to come together! Then a little drybrush with a lightened up base colour. While painting the main body I decided to add a magazine to the weapon, using a chopped up Karman gun. Time for bed now, tomorrow I'll reinforce the gun join with some putty and do some detailing. 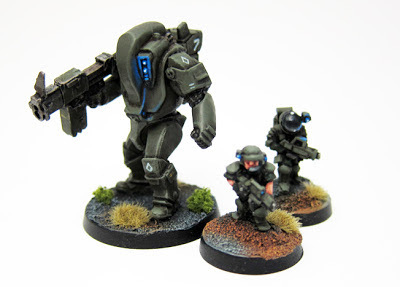 I once converted (lightly) one of these for my UNSC troops to serve as a light mecha. This one has undergone a weapon mod/slight re-posing and will be painted to match my Khurasan Exterminators, whose ranks are swelling by the minute! Finished these guys... Still got a half squad to complete, but at least I sorted out how to do the domes... Black gem with OSL reflected from the blue lights on the side thingy. Tried some freehand graffiti on one of my barriers. The word was inspired by 2000ad's Nemesis the Warlock, one of my favourite old comics. Came out quite well, I think I will try some more. ...From GZG. Nice models, though assembly was a little tricky. It's good to finally get the second one completed. 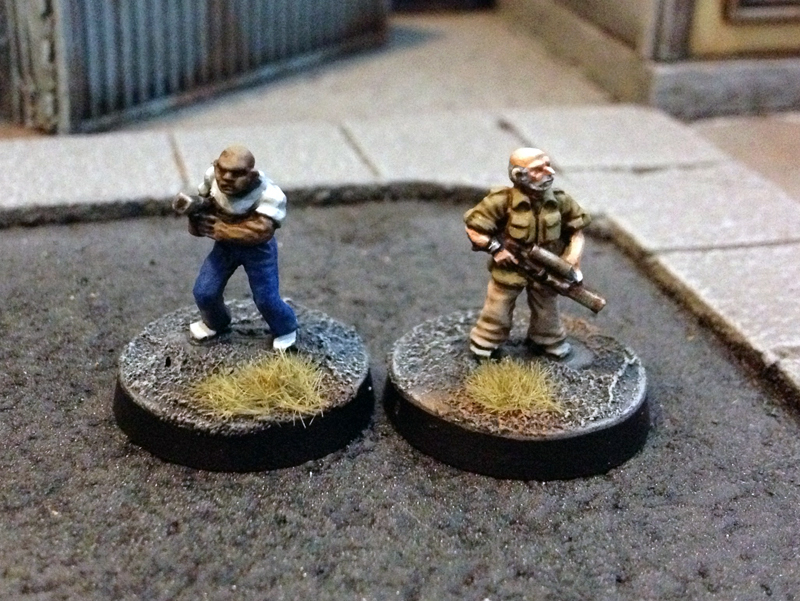 These are 28mm generic barriers from Proxie Models. They are of course fine for 15mm scale too. I based them on thin strips of plastic and used coarse gel medium to texture the bases. A coat of textured paint, a wash and a dry brush took care of the colours. Easy! Been out a lot this week so no fresh work Im sad to say. It was very nice to catch up with my old flatmate Mr. Dave Taylor and family, visiting from the US. Also my best friend of over 20 years, Justin, visiting from Japan! The basing is now finished, this pic is a little old. Once again, very fun to paint and Im looking forward to the next wave! In other news, Im currently re-evaluating my urban terrain... The ruins look a great deal better than the cleans. Solution? Ruin up the cleans! 2 posts today! Here is the finished article, alongside two of his vegetable cohorts! I used the same under-shading method as on the Vornids. 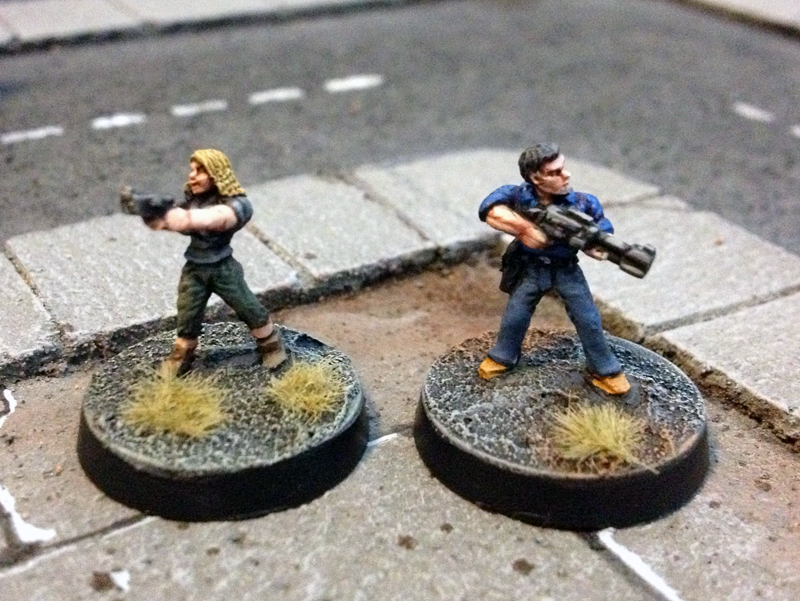 Here is a comparison shot of a 15mm.co.uk model and my conversion. I had a spare and it's neck suited the Vornid shape... Voila, a character model! I used spare parts from the Vornid sprue and pro-create putty. Painted pic in next post! To inaugurate my new regime of smartphone based posts, here is a lovely Monsterpocalypse figure I have had on the go for over a year. I had such fun finishing him that Im inspired to dig back into the box and start another! I originally started an instagram account purely to throw a quick feed of my workbench onto the blog without having to be at my computer. 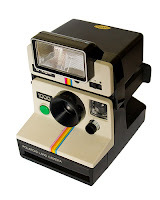 The more I used it, the more I preferred the whole "picture says a thousand words" immediacy of the medium as opposed to take picture/import picture/write post/ publish post- procedure of blogger. Much as I love instagram (which I currently use almost solely as a WIP log btw, you won't see many selfies or shots of my latest manicure on there) I do understand that not everybody uses it (29 followers vs over 350 here) so how to reconcile these two things? What I'm going to try is posting via email (available in the blogger settings) whenever I upload a picture to instagram. It is only a few more button presses and means that you guys will get more frequent updates. I will still have the option to write a longer post, but it will be when I have time instead of getting put off for weeks at a time. So I'm keeping both, but using much of the same content :) As such, I'll take the insta feed off the Blog. "Do you want the good news or the bad news?" - "Give us the bad news"
"There's nothing to read but short instragram style posts." - "What's the good news?" Rick and Darryl pretty much finished! They could probably stand one more tiny highlight, but they look good on the table, and I don't mind my zombie survivors looking a little rough. I'll finish the set and then decide on wether touch-ups are warranted. I have Glenn, the ladies and the kids yet to go. 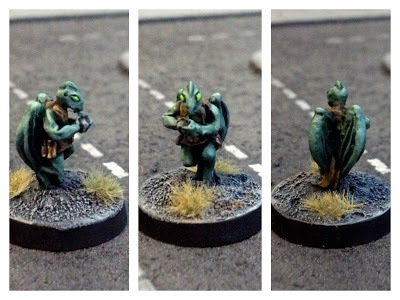 Brilliant sculpts from Khurasan... Couldn't ask for a better set of zed hunters! I am experimenting with a new DIY light tent made out of the same translucent plastic board I've been using to make frosted glass brick walls in scratch built dwellings. 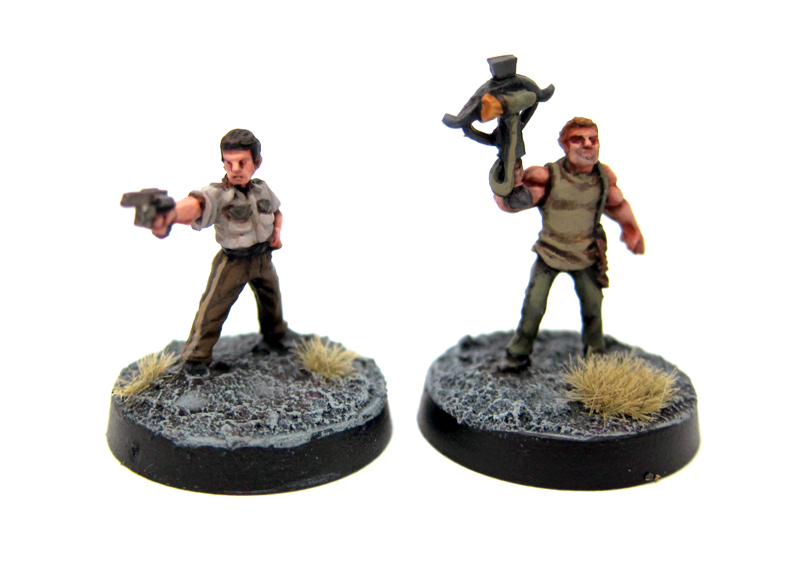 The first four models from the Zombie survivors pack 1 from Khurasan. 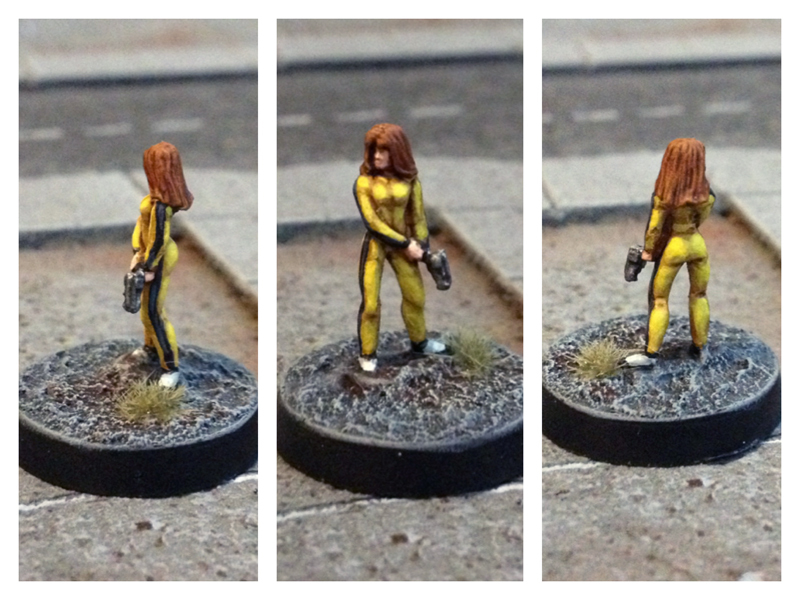 Just incredible figures and a pleasure to paint. My favorite to paint was the "Dale" looking figure. These are very easy to paint, due to their simple costumes and nice exaggerated details... Nothing too fine or too flat. I'm still struggling with completing my urban terrain for the cork tiles. This is because I keep trying to make things that will work for present day and for sci-fi... I bought a cheap hot glue gun that ought to help get through the next few buildings. It's been a rainy weekend in Sydney. After a bit of a sleep-in, I got to work on 3 remaining figures I have to finish for Khurasan, and of course, tackled some fun single minis while they were drying. I am really not enjoying "unit" style painting right now so these have been the perfect tonic. 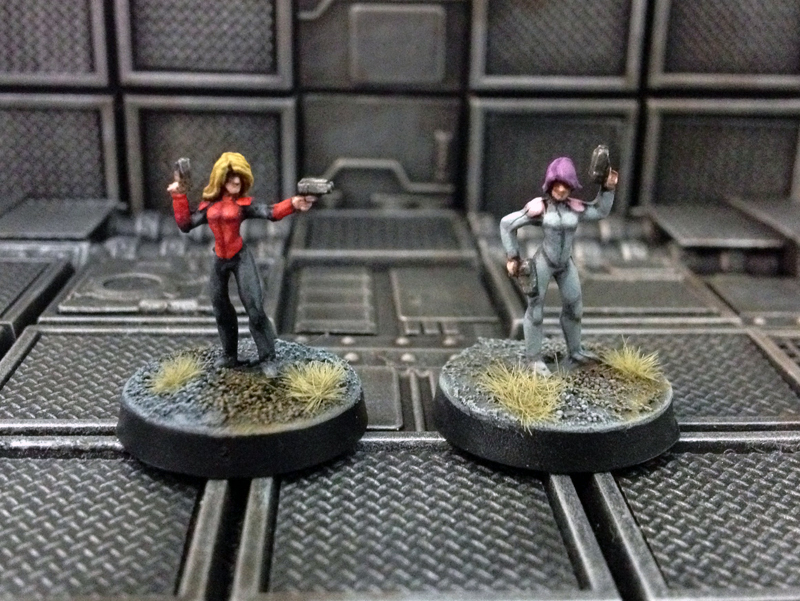 Here is another one of the Black Widow Mercs from Rebel Minis. The inspiration is clearly from "Kill Bill", which sprang to mind after an Iyanden Darksun basecoat. I did a Gryphonne Sepia wash and then highlighted up using Vallejo Flat Yellow. The toughest part was the black stripe... Especially trying to highlight it. I'm pretty happy with the result though. Next, are a couple of robots from RAFM. They are old Traveller sculpts but I think it's obvious where their sculpting inspiration came from. I couldn't help but follow it up with a droidy paint job. 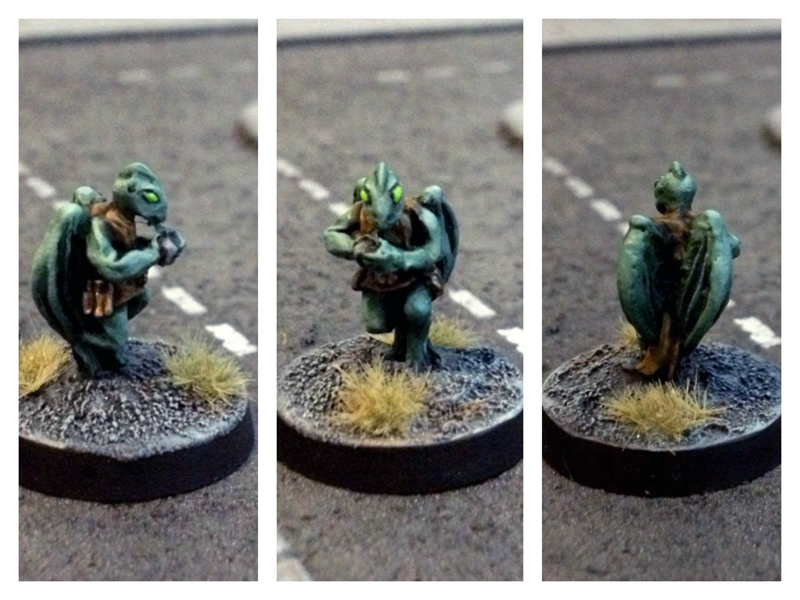 Also from the big bag of RAFM old Traveller minis I have been hoarding... A Droyne ship's crew figure. I still remember when the Droyne were a mysterious new addition to the Traveller universe! 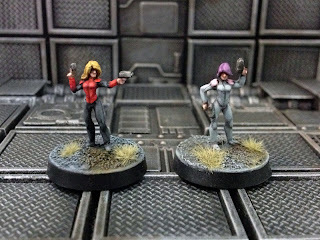 These are 2 figures fom the Black Widow Mercs by Rebel Minis pack. They are very delicate sculpts, much more slender than what I'm accustomed to. Because of this, they are quite fast to paint, if a little fiddly. I went with an anime inspired look rather than the dark tones on the manufacturer's website.They have inspired me to pick up some new paints.. I think my limited collection is a little drab. The detail is what I'd call "subtle" on these. It is extremely well done, but it is my opinion that chunkier models translate better both to the paintbrush and the gaming table. Nevertheless, I really like them. They have a multitude of uses for almost any sci-fi setting. Got to do some painting today, and while the secret stuff was drying I decided to try the glazing method of painting on some Vornids I've had lying around for a long time. 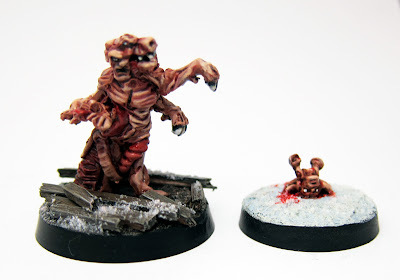 The Vornids are plant-based aliens (or mutants if that's your thing) which are of course very organic sculpts. I began by undercoating them all a dark grey (Citadel mechanicus standard grey) and then washing them with Citadel Nuln Oil wash. When dry, I drybrushed them up with lighter tones of grey and finally white. Then I glazed (painted on a thin coat) with various colors, using Vallejo thinner medium to dilute the paint to a milky consistency. This was not applied like a wash, but in very thin coats so that the greyscale shading showed through. I washed the weapons and mouth parts with ogryn flesh wash to try to further deepen the shadows, I used a little Agrax earthshade wash to deepen the shadows around the leg-stalks. A tiny touch-up with Citadel rotting flesh on the ends of the finger-tenderils and job done! In conclusion, I wouldn't bother using this technique on a human or technical looking 15mm figure... But it's quite effective on monsters like this with a lot of wiggly details.